TCC Military and Student Veterans Association (MAVSA) members didn’t just have a beach bash during a mid-October social in Ocean View. They learned to quilt for a meaningful cause. With the support of the Tidewater Quilters Association, MAVSA members donated their time to make enough quilt squares for six quilts as part of a national community service effort. Quilts of Valor are lap-sized quilts meant for combat troops who have been wounded or touched by war. The quilts are meant to be tangible reminders of America’s appreciation and gratitude. Since 2003, the Quilts of Valor Foundation has distributed nearly 70,000 quilts to veterans. The quilts will benefit the Wounded Warriors at the Cedar Grove Apartments in Hampton. 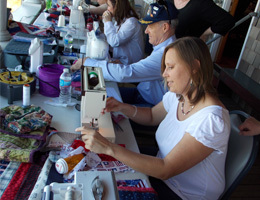 The day of sewing was a rewarding one for all the MAVSA members who participated, said Lynn Goodwin, Project/Program Coordinator for TCC’s Center for Military and Veterans Education. “Many of the members found it therapeutic and they want to do more,” Goodwin said. Kenny Williams, MAVSA president-elect said the afternoon was especially important to him because his brother had been a Wounded Warrior on three separate occasions.